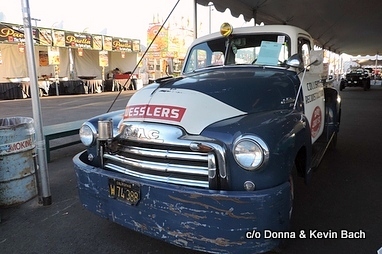 “The car auctions are in full swing in Arizona this week. In just one week six firms will be selling cars and trucks for a collective SEVENTEEN days worth of sales. Probably over $250 million will exchange hands this week.With that many cars on site, you can see just about everything and anything. From over-restored, period authentic, they never “came out of that factory looking that good” art pieces; to cars that make you scratch your head and say why – all sorts of cars cross the auction block. For some people wanting to emulate the “rat rod” look, they create all sorts of illusions of “aged patina” – with flat suede paint, primer sprays and even some aggressive use of sand paper; a look can be produced but the real look just can’t be copied. 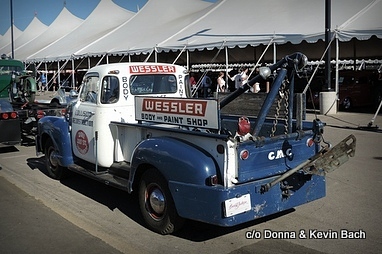 This 1949 GMC tow truck certainly has the look; and the background to support it. 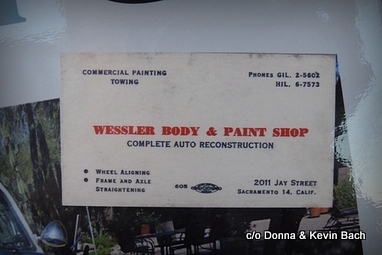 Turns out the tow truck started out for Wessler’s Auto Body Shop, which opened up in Sacramento in 1942. 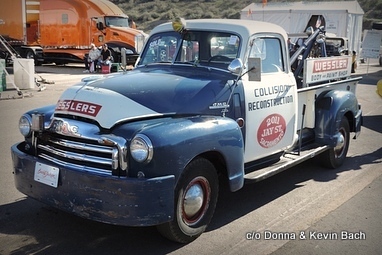 This all-original truck still had a four speed manual transmission and a 228 cid engine. The Manley wrecker boom and winch were said to be still operable. 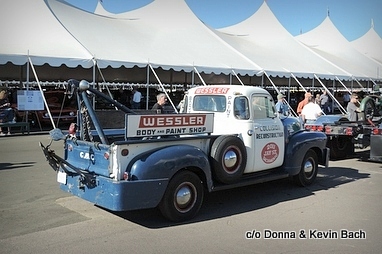 We talked to the original owner of the truck, Dennis Wessler, who is the son of Hank Wessler who founded the body shop. The Wesslers moved out to Sacramento after their honeymoon. Hank Wessler, being an old farm boy, knew enough about machines and welding to work at the shops in Sacramento and learn the auto trade. 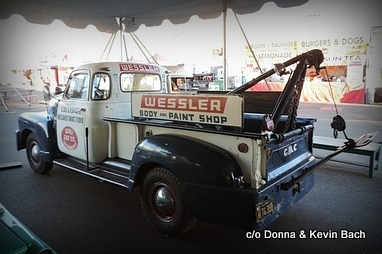 In 1942, Hank Wessler decided to go into business for himself and set up shop on in a garage behind his house. During the war, he welded airplanes in the day, and worked on the cars at night. After his business grew, he moved to the shop on J Street , which still stands today. 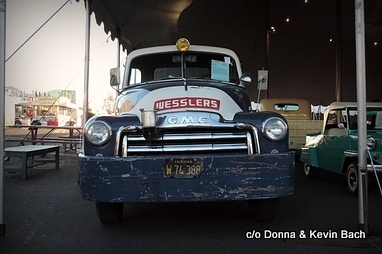 In 1949 Hank Wessler saw the new GMC pickup sitting on the lot of FB Hunt Trucking, after a local farmer had cancelled his order. After a few months of negotiating Hank became the proud owner, paying around $2,000, and after a few months converted it to a tow truck, engineering the winch setup in the bed of the truck and adding eight ply tires. 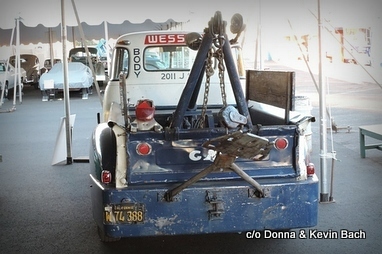 Hank also engineered the rear end yoke so he could easily tow the Model A’s and T’s without banging them into his rear bumper, like other tow trucks of the day did. At that time a wooden ferry moved cars across the Sacramento River and the causeway and occasionally one vehicle would slip off the ferry into the water. This truck was designed to help pull them out and helped build his business. Dennis recalls that another source of referrals were the nearby Navy pilots. Seems they would buy sports cars from an importer near the body shop and then race them at the airport. But the end of the airport was rocks and gravel from nearby mining barges, and they needed the Wessler tow truck to haul them out on to the asphalt. Then of course the body shop could fix all the metal damage that had resulted from the run off. 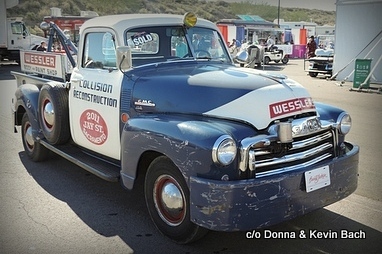 Dennis Wessler grew up in the business and used the tow truck at the local raceways. He used the truck to push start the Indy cars that raced at the state fairground’s one mile dirt track. Dennis stated he used the truck for Mario Andretti’s Indy car as well as for other notable racers. Dennis stated that they used the truck nearly every weekend for the dirt tracks at Capital Speedway and Hughes Stadium. Since they used salt on the clay tracks to firm them up, every Sunday he would take the truck down and power wash the underside to avoid any salt corrosion. The truck was a workhorse in the business, on call 24 hours a day, until the 90’s when insurance and state registration fees became excessive. 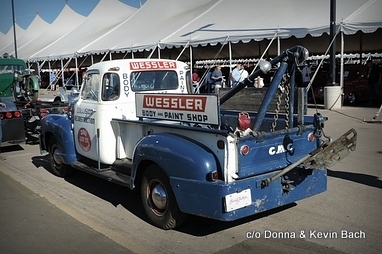 Finally, rather than sit unused at the shop, Dennis Wessler sold it to a local shop, James Auto Wrecking in 1998 with 96,000 original miles and was surprised to hear it had been sold this week at Barrett-Jackson. Dennis added it broke his heart to sell the truck. When I asked if Dennis had access to the Internet to see the auction listing he replied “Absolutely not!” The Wessler’s finally shut down the shop after the son had been in the business for fifty years.The shop still has twelve cars in the bays and is ready to start up again for the right buyer. The side driver’s window had a nice crack and some obvious delamination showing and the truck had lots of paint transfer and dings that would take a body man weeks to hammer out. Dennis probably recalls where every one of those dings came from! But it caught people’s attention. And since it was near the food trucks, more than one spectator thought nothing of leaning against it while eating their greasy hamburger. The interior was spartan but sported a clip board to allow the driver to write down his next tow order. It sold on Wednesday at Barrett-Jackson for $12,650 and even included the original title and a company business card”.